Find out how we will help you translate your lifestyle needs into a beautiful customized kitchen. How do we Compare to other Kitchen Manufactures? Flexible Design Process Our designers are highly experienced and will offer you extensive help. Many of the Top End Kitchens Manufactures have highly experienced designers who will offer extensive help. It depends on the company but generally limited. Often the in-house designer is limited to just a few hours hours of consultation before being required to ask for a deposit. Yes, we offer one of the most transparent price structures on the market for standard units. Our designers are highly experienced and will offer you extensive help. Yes – We make all our kitchens in our factory in Co Wicklow. Many of the Top End Kitchens Manufactures have highly experienced designers who will offer extensive help. It depends on the company but generally limited. Often the in-house designer is limited to just a few hours hours of consultation before being required to ask for a deposit. Book an appointment to come into our kitchen showroom and meet with one of our designers who will go through your needs and lifestyle to develop a design that is in tune with how you live. We will explore your preferred kitchen styles, accessories and appliances during your initial consultation. Then our designers will develop a preliminary outline design to meet with your specific needs and budget. Our designers will contact you to make a follow up appointment in our showroom so we can share and review the preliminary design with you. We will discuss ALL the costs of the various options you are considering and put a final quote together. Once the kitchen design and costs are agreed, we will prepare a contract for the ‘construction and installation’ of your new kitchen. At this stage each party commits to the project and the price and specification agreed. You will pay a booking deposit to confirm your purchase. We will arrange a suitable time to call to your address to assess the room and confirm all measurements. During this survey, we will identify where the electrical sockets and extraction opening should be located in your kitchen for your electrician and plumber. 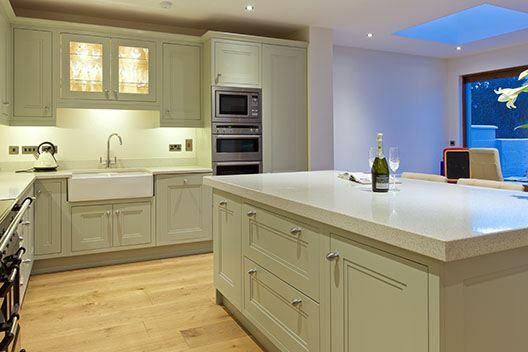 Our Kitchen installers will fit your kitchen cabinets and worktops over a 1 to 3 day period. This time will vary depending on the size of your kitchen but the majority of kitchens are installed within two days. If you have ordered granite worktop, we will arrange with the worktop manufacture to visit your home, scan the worktop area and build out a highly precise virtual replica of the area your worktop will be installed in. They will return to install the worktop within ten days from the time of template. Fitzgerald Kitchens was set up in 1987 by two brothers, Des and Eamonn Fitzgerald. They started from humble beginnings in Hacketstown, Co.Carlow in a tiny shed behind the local Curates house. Their father, Jack Fitzgerald operated in Hacketstown from 1974 making custom built furniture with Des and Eamonn’s older brothers who used the business to finance their college education. In 1988, Des and Eamonn moved the business 6 miles down the road to Tinahely, Co Wicklow and upgraded to a 3000 square foot facility, and in 1996, bought their own premises in the centre of the village. It wasn’t long before they quickly outgrew that and so they built a purpose built factory in Lugduff on the outskirts of Tinahely in 2004 where they have operated from ever since. We like to keeps things personal, warm and on a human level with both our staff and especially our customers. So feel free to drop by any of our Showrooms and chat about your kitchen. Des is the Head Master Cabinetmaker and served his time in Mc’Ivors Furniture in Prussia Street in Dublin hand making reproduction dining and sitting room furniture. Des has also worked in Denmark and has built up an extensive knowledge of furniture production. Des looks after the production side of the business and is our factory manager. Eamonn, also a cabinet maker, works on the sales and business development side of the business. Stephanie joined Fitzgerald Kitchens in 2015 and takes care of design and sales in our Dun Laoghaire Showroom. Darren started with Fitzgerald’s in 1997. He left when he completed his apprenticeship and worked in Dublin and returned to Fitzgerald Kitchens in 2010. Kevin started with the company in 1994. He left when he completed his apprenticeship and moved to Australia. After he returned to Ireland he started working for Fitzgerald Kitchens in 2011. Brian was Fitzgerald Kitchens employee No.1. He started as an apprentice in 1988, left and moved to Australia where he worked as a cabinet maker. After he returned to Ireland he started back with us in 2009. Brian is a highly accomplished craftsman and makes all the doors and frames for Fitzgerald Kitchens. Paul served his apprenticeship in 2001 and when he finished his time and headed to Dublin. He worked as a cabinet maker for Q.K. for many years and returned to Fitzgerald Kitchens in 2008. He nows works fabricating cabinets on the shop floor. Ian started his apprenticeship in 2005 and works with Paul making kitchen cabinets. Pawel joined Fitzgerald Kitchens in 2011 and hand paints all the kitchens before they leave the factory or on site.